I received the note below today. Why the writer thought it would have any impact on my perspective is beyond me. It does not. But I present it to you for your independent perusal. I revert to your post made this past year regarding the Satmar Rebbe's views of Rav Kook z"l.
In response to my e-mail request to you then (see attached PDF) you edited your blog and humbly watered down your negative statement about the Rebbe. But, more importantly, here's some reading material that I had just recently become aware of and took the time to copy the text in order to share it with you. Many may have known the Satmar Rebbe, but Rabbi Chaim Moshe Stauber was the Rebbe’s personal “hoiz bochur”…. close attendant and personal confidant ...., spending over 20 years in his radiant presence. Handpicked by the Rebbe for many important missions, he served the Rebbe until his final days. In his unique biography, The Satmar Rebbe: The life and times of Rav Yoel Teitlbaum zt"l published by Feldheim, he not only chronicles the Rebbe’s remarkable life, but invites you into the Rebbe’s innermost offices. One story, perhaps not widely known, deals with the Rebbe’s views of Rav Kook z”l and his own remarks. For Shavuos, the (Satmar) Beis Medrash was majestically decorated with flowers and greenery. Guests from out-of-town including Chassidim from Eretz Yisroel, South America, Europe, and Canada, were seated throughout the Beis Medrash. Of the many people who came to Williamsburg to be with the Rebbe for Shavuos, was a special Rav from Chicago, Rabbi Dovid Winchester. Rabbi Winchester was a native Chicagoan who had learned in Chevron Yeshiva during the pogroms of 1929, and miraculously survived. The clean-shaven Rabbi Winchester was a talmid chacham, but was certainly not a Satmar Chassid. He was the rabbi of the Nussach Ari Shul in Chicago, so why did he leave his own congregation to spend Shavuos with the Rebbe? The Rebbe had gone to Chicago for the wedding of the daughter of the Weitzener Rav, Reb Zvi Hirsch Meisels. At that time, he gave a drasha that lasted two-and-a-half hours, and Rabbi Winchester was so impressed with the Rebbe's Torah erudition that he looked for opportunities to be near him. On one occasion, he heard the Rebbe blame Rav Kook for "building the bridge between religious Jews and Zionism," and Rabbi Winchester, who had been Rav Kook's talmid and personal aide, protested. The Rebbe took him aside and clarified for Rav Winchester why he blamed Rav Kook more than anyone else. As a result, Rav Winchester took it upon himself to begin learning through all of Shas, and strove to be every Shavuos -Kabbalas HaTorah- at the Rebbe. Today's debates over the place of religion in modern life often showcase the claim that belief in God stifles reason and science. As Richard Dawkins writes in his best-seller "The God Delusion," religious belief "discourages questioning by its very nature." In "The End of Faith," his own New Atheist manifesto, Sam Harris writes that religion represents "a vanishing point beyond which rational discourse proves impossible." The argument that religion suppresses rational inquiry is often based on the idea that "reason" and "revelation" are opposites. On this view, shared by atheist crusaders and some believers as well, the whole point of the Bible is to provide divine knowledge for guiding our lives, so we don't need questioning and independence of mind. 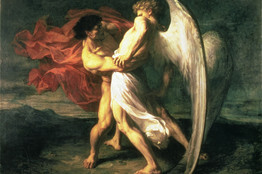 Independent thinker: 'Jacob Wrestling with the Angel,' 1865. This dichotomy between reason and revelation has a great deal of history behind it, but I have never accepted it. In fact, as an Orthodox Jew, I often find the whole discussion quite frustrating. 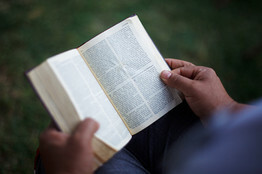 I will let Christians speak for their own sacred texts, but in the Hebrew Bible (or "Old Testament") and the classical rabbinical sources that are the basis for my religion, one of the abiding themes is precisely the ever-urgent need for human beings, if they are to find what is true and just, to maintain their capacity for independent thought and action. Almost every major hero and heroine of the Hebrew Bible is depicted as independent-minded, disobedient, even contentious. Abraham, Isaac and Jacob, Joseph's brothers, Moses and Aaron, Gideon and Samuel, prophets such as Elijah and Elisha, and exilic biblical figures such as Daniel, Mordechai and Esther—all are portrayed as confronting authority and breaking the laws and commands of kings. And for this they are praised. But aren't these biblical figures just disobeying human institutions in response to commands from on high? Not at all. Very often the disobedience we see in Hebrew Scripture is initiated by human beings with no word from God at all. Thus the midwives Shifra and Pua resist Pharaoh's decree to murder the Israelite children in the Exodus narrative. And Moses' mother and sister hide the infant boy, although it is against the law. And Moses grows up and slays an Egyptian who is beating a Hebrew slave. None of these deeds is initiated or guided by divine command. Like many other stories in the Bible, they tell us about human beings who make their stand entirely on their own authority. Almost every major figure of the Hebrew Bible confronts authority and breaks the law. independence of mind only with respect to other human beings, and that they become pushovers when God enters the picture. But that isn't right either. Many biblical figures dare to extend their arguments and criticism to God himself. Abraham is famous for challenging God over the fate of Sodom: "Will not the judge of all the earth do justice?" Moses repeatedly argues against God's intention to destroy Israel. David is outraged over what he sees as God's unjust killing of one of his men, and similar arguments with God appear in Isaiah, Jeremiah, Ezekiel, Havakuk, Jonah and Job. Nor do these biblical figures stop at just arguing with God. They also disobey God. Abel disregards God's instructions to go work the soil, while his brother Cain obeys—yet it is Abel whom God loves, not Cain. Moses, too, directly disobeys God's command to lead the people up to Canaan after the sin of the golden calf. Aaron refuses to conduct the sacrificial service as commanded after God kills his two sons. The daughters of Tzelofhad even demand that Moses alter God's law because they deem it unjust. And in all these cases, the biblical narrative endorses such resistance. The Bible acknowledges this pattern explicitly when God gives the name "Israel" to Jacob and his descendants, saying: "Your name will no more be called Jacob, but Israel, for you have contended with God and with men and have prevailed." Reread that last sentence. It says that the God of Israel so cherishes independent-minded men and women that he himself names them Israel, meaning "will contend with God," as a sign of his love and esteem. The claim that the Hebrew Bible seeks to suppress inquiry and argument can be maintained only by way of colossal ignorance or willful distortion. In fact, no literary tradition of the pre-modern world—including Greek philosophy—was so effortlessly radical in its endorsement of human questioning, seeking and argument. And few have rivaled it in modernity either. Perhaps it is time for the participants in the great "religion wars" of our day to give the Hebrew Bible another read. —Dr. Hazony is the author of "The Philosophy of Hebrew Scripture," which has just been published by Cambridge University Press. A version of this article appeared August 25, 2012, on page C2 in the U.S. edition of The Wall Street Journal, with the headline: The God of Independent Minds. We are in the process of organizing our schedule for this coming fall and winter. We have a large repertoire of topics and programs. as well as hotel scholar-in-residence events and programs. Our contact information, brief bios and an endorsement by Rabbi Yosef Davis, founder and director of TorahAnytime.com, are below. Please contact us to discuss, plan and schedule programming. Please also feel free to forward this email to anyone you think might be interested! Rabbi Yosef Gavriel Bechhofer is a Rebbe at the Mesivta of Yeshivas Rabbeinu Yitzchok Elchonon (commonly known as MTA) in Manhattan, and a frequent Maggid Shiur at Yeshivas Ohr Somayach in Monsey. Rabbi Bechhofer is the author of one of the most popular tracts on the subject of metropolitan eruvin, and serves as a consultant to communities across the continent, facilitating the building and maintenance of urban and suburban eruvin. He is also an editor at Artscroll/Mesorah Publications, most recently involved with the Daily Dose of Torah project. Rabbi Bechhofer has served as a Rav, Rebbe and Rosh Kollel in the Chicago and New York areas. Rabbi Bechhofer is one of the few individuals to have served as a Maggid Shiur for both the Daf Yomi Bavli and the Daf Yomi Yerushalmi. He is also a senior lecturer for the Aishdas Society, an association devoted to more profound understanding and experience of all aspects of Talmud Torah and Avodas Hashem. He has served as a guest Maggid Shiur, scholar in residence, and lecturer in numerous venues, including Alberta, Georgia, Illinois, Indiana, Michigan, Minnesota, Missouri, Montana, Ohio, Ontario, New Jersey, New York, Tennessee, Washington, Wisconsin, Israel and England. He is a prolific author. He has published many essays in major Orthodox Jewish periodicals. His published seforim are: The Contemporary Eruv: Eruvin in Modern Metropolitan Areas, Bigdei Shesh on Bava Basra, and Bigdei Shesh on Sefer Shoftim. Rabbi Bechhofer learned in many yeshivos, including Sha’alvim, Ner Yisroel and both Mirrer yeshivos. He received Semicha from Rabbi Yitzchok Kolitz, Chief Rabbi of Jerusalem, and Rabbi Zalman Nechemiah Goldberg, Av Beis Din of Jerusalem. He holds an M.S. in Education (concentration in Counseling and Guidance) from Johns Hopkins University. Dr. Shani M. Bechhofer is one of the foremost authorities on all aspects of the contemporary world of Chinuch. She is a much sought-after consultant, who recently formed her own consulting agency. Dr. Bechhofer is also an instructor in Torah Umesorah's Aish Dos professional development division. In her over twenty-five years as an educator, Dr. Bechhofer has held the positions of teacher, principal, menaheles, researcher, evaluator and professor. Notably, she was featured in U.S. News & World Report for her leadership as Principal of the Hanna Sacks Bais Yaakov High School of Illinois. Rabbi and Dr. Bechhofer, who live in Monsey, have six children, the oldest of which is married and recently presented them with their first grandchild. R' Yosef Gavriel does many impressive things very very well. He is a Rebbe par excellence, a community leader, an author, mentor, and a true inspiration to those striving to live a true Torah life (to name a few). I have heard first hand from his students at Ohr Somayach Monsey what a tremendous positive impact he has on their lives. He is on the front lines molding and shaping the future of Klal Yisrael. TorahAnytime.com has had the zechus to record and disseminate his Torah for years to the benefit of thousands of Jews worldwide. He consistently delivers stellar shiurim that jog the mind and leave delicious food for thought. I would highly recommend getting in touch with him for your next speaking engagement or Shabbaton. Plan, check and maintain your eruv! Most urban and suburban eruvin in North America are of doubtful kashruth. Both the construction and the maintenance of urban and suburban eruvin entail complexities and complications. Numerous issues arise in the design and in the building of an eruv. Just as many issues arise over time in the ongoing upkeep of an eruv. I am in the process of organzing my schedule for the coming fall and early winter. These are ideal times for Eruv fieldwork! In this case, the photo is not serving as R' Micha Berger's avatar, but is represents itself, R' Avrohom Eliyahu Kaplan. Much of the problem of Yeshiveshe Orthopraxy may be rooted in the phenomenon in the Olam HaYeshivos that can be expressed most succinctly in the two words "Brisk won." We know who lost: Slabodka, Telshe and Novhardok. The bold, courageous, lyrical, poetic, musical, mystical, thoughtful, inspiring, transcendent, uplifting, awesome [add adjectives as appropriate] core is gone - except to those few lucky enough to have had a rebbe or rabbeim introduce them to that bygone world, and to those even fewer lucky enough to have stumbled upon its relics on their own. Who can read Reb Avrohom Elya Kaplan zt"l and not know - with "wow moment" after "wow moment" - that this is authenticity beyond all else in the world? There are other great writings - such as the Introduction to the Sha'arei Yosher - that have the same effect. And, I don't think we "Yeshivadox" could flourish without the writings of another (unrelated) Kaplan - Rabbi Aryeh Kaplan zt"l and numerous other heroic figures. But - I know this is a bit of hyperbole, but only a bit - read B'Ikvos Ha'Yirah - and see if so many of the issues that oppress you suddenly seem small. If that's not enough, go on to the poetry (well do that in any event). Orthopraxis has always been with us. (Okay, maybe not at maamad har Sinai, so "always" here means since some days after.) Many people simply don't care enough to develop a personal philosophy, and just run on culture. This is something different. People who have a personal philosophy based on scientism (the belief that all real questions are those science can address), and still just run on culture. 1. Those who glorify in scoffing are exhilarated. 2. Those who are sincere are confused and disheartened. In reality, there is no reason - nor authentic source - to say that Chazal knew science at all. The clearly evident proof of this is the Gemara in Avodah Zarah 4, in which we see Adam HaRishon - yetzir kapav kivyachol of HKB"H - utterly ignorant of the basic phenomenon of seasons. 2. Astute observation of phenomena that came to their attention. 3. A total commitment to emes. To be sure, the allure of scientism is strong. It is also utterly shallow, the refuge of a generation (both general and Jewish) that has lost its sense of the poetic, that equates sexuality with love, that animalizes its emotions rather than angelizes them - a generation that mistakes the superficial understanding of "what" and "how" with the transcendence of "why." Or, to cite Dr. Isaac Breuer, a generation that confuses ויהי with יהי! I just got off a long phone call with a new acquaintance, who feels surrounded by chaverim who went to yeshivas of the what-is-now-called "Charedi" variety (including one of my almae matres, the Mir in Brooklyn), who are now Orthoprax - religious in facade, and atheistic or agnostic at core. To his mind, two separate individuals serve as inspirational beacons for these fellows: Baruch Pelta and James Kugel, and that one of the major prooftexts of their derech is a 1987 Supreme Court decision. The fellow who called me essentially asserted that I have a moral obligation to publicly throw down the gauntlet. I will do so, but only in a modified manner, on account of time constraints - viz., should anyone like to question me or engage me in conversation on perspectives they have gleaned from these - and other -authorities and sources, I am happy to make myself available privately and/or publicly to respond - so long as I myself can remain not-committed to put my points and/or counterpoints to paper, whether real or virtual. At the acknowledged risk of misrepresentation or distortion, others may do - for now, I personally have not the time to take on such a commitment. This past Thurs. night I was asked to give a short pre-Motzo'ei Shabbos ma'ariv shiur at a prominent local shul. No payment offered, no payment asked, no payment expected. Torah shel chesed. I spoke about the El Al ticketing isssue, correlating lifnim me'shuras ha'din and Kiddush Hashem. To talk to your shul about lifnim meshuras hadin was a waste of breath. That parishioner responded simply: "Ouch." I am surprised that no one thanked the speaker. It has been my experience that people have thanked speakers for their time and words. This tzibbur has many fine middos tovos. I am sorry that Rabbi Bechoffer had such an experience. In this week's parasha (15:14) we find the mitzvah of ha'anaka to a freed eved ivri. This mitza has served over the centuries as the basis for the minhag to grant severance pay to terminated workers. The word basis is very important to understand, as the basis for a minhag does not necessarily yield the parameters of the minhag that ultimately evolves from its basis. The minhag, once established, takes on a life of its own, is its own independent organism, and develops and evolves on its own. The case of severance pay is a classic case in point. There is no point in attempting to correlate the parameters of this minhag with the parameters of the mitzvah of ha'anaka. But there is very much a point in attempting to ascertain the parameters of the minhag of severance pay in and of themselves. Particularly in our day and age, when the issue of severance pay is often a major issue in the worlds of chinuch, rabbonus and other klei kodesh positions - often culminating in Dinei Torah, which in and of themselves are often adjudicated by unscrupulous zavla courts. The publication of the sefer - kettan ha'kamus ach rav ha'eichus - "Chodesh L'Shana" is a very positive development. The author is Rabbi Naftali Zvi Frankel. His address and phone number are in the book, and he has email access as well. As he has not explicitly permitted me to publicize his email address, you can write to me and I will forward your comments to him. It records the written opinions of many of the greatest yoshveial m'din in North America, Eretz Yisroel and Europe that the normative operative minhag is that formulated by the מרא דארעא of North America, Rav Moshe zt"l, of severance pay of a month of salary per year of employment. 1. Klei kodesh is defined as a role that only a Jew can fill - viz., a Mashgi'ach, a Mechanech, a Shamash in a shul, etc. For all these positions, severance pay is chodesh l'shana. 3. The severance is only due if the employer terminates the employee, and vice versa. 5. An institution that has shut down and is no longer functioning is exempt from the obligation. 6. During the first two years in a position, a Mechanech is in a probationary status, and has no right to severance. However, if he continues in the position beyond the first two years, in the event of his eventual termination, the first two years are included in the calculation of chodesh l'shana. To conclude, there are nevertheless mosdos and administrators who assert that they are not subject to the minhag of chodesh l'shana. Moreover, I have recently heard that some mosdos are now writing into their contracts that they do not abide by the minhag of chodesh l'shana. When I hear of such happening, I am often led to wonder whether these ostensible leaders are actually מאמינים שיש דין ויש דיין. 10 pm EDT. 9 pm CDT, 7 pm PDT. Answer the invitation to the Google Hangout at that time. The first request is that we should not learn Torah as a tool to embarrass or shame others. The second request is that we should learn Torah even shelo lishma - for which the reward is b'smola osher v'kadod. The third request is that we should Torah lishma (orech yamim b'yemina - l'yom she'kulo aroch) - with the approaches and ideals of ahavas Torah and yiras shomayim. With this approach we can also explain the apparent redundant mention of yiras Shomayim, v'duk. Cute Siyum HaShas anagram from a correspondent! If you'd like to share this on your blog, I think your readers will enjoy it. For audio only: At the scheduled date and time of the conference call, dial the conference line: (209) 647-1600 and enter the access code followed by the pound sign: 435678# when prompted.